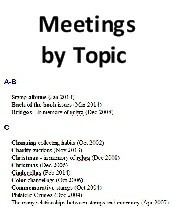 The following is a list of the eUSC monthly meetings sorted by meeting topic. eBay�s changes: how do they�affect you? A meeting devoted to philatelic friends who are no longer with us (dedicated to Bob Lodge and everyone else we've lost, including non-board friends) possibly some of these people mentored us or started us off in a certain collecting direction. Also an attempt to locate those "MIA". Includes an eUSC eBay ID check in. Tough issues: What are the hardest things to figure out in the areas you collect? watermarks that are too similar, colors, paper types or printing methods, etc. Things starting with these letters: A, B, D, E & F, G, P, S &T.
If you can add other meeting topics to this list, please let me know.